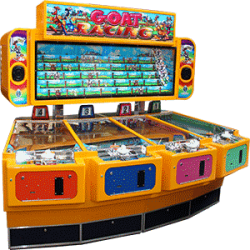 Players must drop their coin into the slot with precise timing so the coin falls into one of the rot..
2 Player quick-coin ticket redemption game with trucking theme.Use skill to time the roll of your co..
Quick-coin, 10p roll down game with redemption tickets.Roll the coin to the other side of the moving..
Circlerama is a 4 player, Quick-Coin ticket redemption game. Players time the drop of their coins to..
Quick-Coin action play. Skill Controller coin entry with built in progressive bonus feature.Features..
Upright punching game with safe 'rope' mechanism to avoid wrist injuries.Punch impact measured by se..
Ferris Wheeler is a unique quick-coin game with wide appeal. Players insert coins that drop down the..
2 Player, Quick-Coin, roll down ticket redemption game.Equipped with attractive cabinet, LED lightin..
2p Quick-coin, 2 Player, ticket redemption game from Harry Levy with fun duck theme.Players roll the..
Lucky Zone is so simple to play that no instructions are necessary. Simply drop a coin in and watch .. Ticket out version of Pharaoh's Treasure, 4 Player pusher ga..
2 Player coin roll down belt game with neon lighting and video display and sound system.Bright, colo..